HERITAGE HIGHLIGHTS: The cross marks a significant point in the history of Britain. A Victorian cross in Celtic style marks the traditional site of St Augustine's landing in AD 597. Augustine and his supporters supposedly paused here to say mass before travelling on to Canterbury. St Augustine came to Kent with the mission of spreading Christianity to the inhabitants. They were not coming to a completely pagan outpost, as the queen of Kent was already Christian, and this helped pave the way for Augustine's success. In 1884 the 2nd Earl of Granville, Lord Warden of the Cinque Ports had the cross erected. The carving is by J. Roddis of Birmingham and uses typical Celtic decorative themes, including strange beasts, angels, and archbishops. 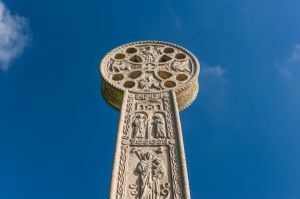 The cross is fairly simple but the carvings are fascinating, with beautifully formed scenes in Celtic style on all four sides. The base of the cross sits on a platform inscribed with a dedication to Earl Granville, and there are two plaques set into the earth at the base of the cross, one in Latin, one in English, with further dedications. After many dangers and difficulties by land and sea Augustine landed at last on the shores of Richborough on the Isle of Thanet. On this spot he met King Ethelbert and preached his first sermon to our countrymen. Thus he happily planted the Christian faith which spread with marvellous speed throughout the whole of England. A.D. 596. The cross is well signposted off the A299 and A256 just east of Ramsgate. From the junction of the two A roads, a small road named Cottington Road leads under an overpass for the A256. The cross is in a field almost immediately east of the overpass, around a sharp right corner. Be warned! There is no immediately obvious sign for the site. We drove right by it before I did a double-take and realised we'd just driven past the cross. There is a small layby with room for 2-3 cars on the south side of the road (heading inland, away from Cliffs End). There is a small English Heritage sign at the entrance to the field, and that's about all. It will take no more than 5 minutes to see the cross, though to be fair I really enjoyed the carving, which seemed to capture the ebullient style of Celtic design rather well. Location: Off the B29048 2 miles east of Ramsgate, and immediately west of Cliffs End. A very short walk uphill from the Thanet Coastal Path.